Brand: WeGirls Eye type: Blue/Closing Size: 46cm/18" Hair: Brown-Blonde/ Rooted Articulation: 5 points This beautiful 46cm/ 18" doll called Sara, is made in Germany for Polish brand, WeGirls. Sara is lovely to pose as she has a tilting head, as well as great movement at the shoulders and hips. She has thick long layered centre parted rooted brown hair full of blonde sun-kissed highlights. Her hair would be suitable for careful brushing with the Essential Doll Hairbrush which has metal teeth that will not pull out the hair. Her lips are a natural coral colour with a tiny bit of gloss on top. Her cheeks are blushed in a shade of coral and her eyes are a lively, friendly blue, and close when she is laid down to sleep. The vinyl material is phalate free and soft to touch. It is matt in texture and can be compressed under a little bit of pressure. Sara comes wearing the WeGirls of the world T-shirt with casual blue trousers. Her pink camouflage print knickers are a funky touch, and on her feet she wears green converse style shoes. Around her wrist she has a Membership card which children will love as they can use it to go online and play games! We're absolutely delighted to be able to offer customers this European produced range of dolls made by Schildkrot, a manufacturer we're familiar with, and from a region steeped in doll making history. Indeed, the finest European materials and craftmanship are used to make these WeGirls play dolls. Sara is safety tested from age 3 and has the body shape and face of a young child. She would make a great doll best friend for a child of age 3 to 9 and unlike some dolls is particularly suitable for the younger children. 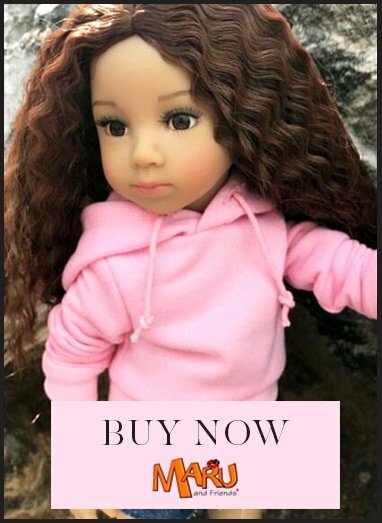 We would like to highly recommend this doll to parents looking for a traditional, beautiful doll for a child. Read more about WeGirls. WeGirls Measurements & Care Instructions.